We’ve been hearing about Ryan Murphy’s Scream Queens for months now, and if you’ve been keeping tabs, you may already have some idea about what the show’s premise is and what the general tone will be. However, today Fox just released the first trailer for Scream Queens, and it looks like the weirdo baby of several other Ryan Murphy projects. Seriously, check it out. It’s a screeeaaam. 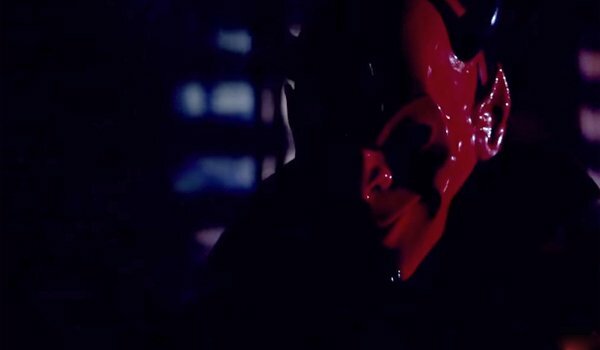 Like parts of Glee, the series is set in college, only Scream Queens will follow a sorority that is threatened by some person wearing a red devil mask that rivals the Scream mask in terms of creepiness. We’ve known for a while that Jamie Lee Curtis is signed on to the series, playing the Dean on the college campus. American Horror Story’s Emma Roberts, Ariana Grande, Glee’s Lea Michele and more are highlighted in the brightly lit horror trailer, which infuses a campy tone with a few truly scary moments, just how Ryan Murphy likes it. Emma Roberts is taking a lead in the series, playing Kappa sorority leader Chanel Oberlin, who wears absolutely ridiculous costumes in the new trailer. Got to love it. Anyway, it looks as if the sorority is working on gathering new recruits for the year in the early footage, and some dude is warning at least one of those recruits off, calling the sorority "dangerous." Sure enough, a short time later the “devil” in the red mask shows up, and the ominous warning seems to prove true. With Glee ending just a couple of months ago, Fox is definitely looking to replace its school-oriented dramedy with something of a similar ilk. Fox does a lot to mention both Glee and American Horror Story in the trailer, and it seems pretty clear that the network is trying to engage with fans of both shows with its new hybrid drama. With Curtis, Michele, Roberts and more on board, hopefully the network will find itself with a hit. Scream Queens is getting a pretty good timeslot over at Fox, hitting the schedule in the fall, on Tuesday nights. The hour-long program will air on Tuesdays at 9 p.m. ET, but will have a bit of a tough row to hoe, airing opposite the brand new programs The Grinder and Grandfathered. Hopefully, it will be able to capably anchor the night without support from a veteran series. Take a look at Fox’s full 2015 fall schedule, or check out what the rest of the networks have going on here.